The top view of an underground shelter. Vivos offers 4,000 spaces for sale at 20 nuclear blast proof sites across the United States. Worried about where to take refuge in case of an asteroid hitting the Earth, a nuclear attack or some other apocalyptic event? 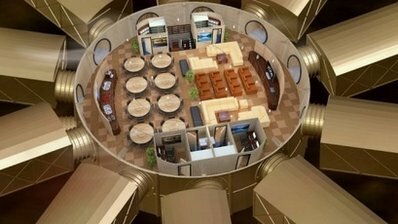 An American business has the answer: an underground bunker equipped with all the modern comforts. "You can& #39;t predict, but you can prepare," says the website of Vivos, which plans to sell 4,000 places in 20 nuclear-proof shelters, all on US territory. The cost of admission is 50,000 dollars, and children get half-off. Pets are free. "Sooner or later something is going to cause us to seek shelter," the company& #39;s owner, Robert Vicino, told AFP. "The threats are all around us." His business project merely offers a practical option, he said. "We are not promoting the fear, we are providing the solution, at least a viable one." The company& #39;s website features a countdown to the apocalypse supposedly forecast by Nostradamus and the Mayan calendar, noting the time left until December 21, 2012. And even if the world does not end according to prophesy, Vivos carefully lists a myriad of other dire scenarios for prospective customers: solar flares, nuclear terrorism, volcanic eruptions, killer comets, magnetic pole shifts, global tsunamis, and chemical or biological attacks. "It& #39;s really not about 2012, something could happen tomorrow or 20 years from now," Vicino said. He said the threat he fears the most is an American meltdown, "social and economic anarchy." Despite the potential dangers, both natural and man-made, only government leaders had a way of staying safe, he said. "The government has a solution and they& #39;ve been preparing, for the last ten years or so, very large underground shelters for the government and the elite," he said. "If you& #39;re not connected and you& #39;re not the elite, you& #39;re not going to get in." A portion of the bunkers for sale include Cold War-era nuclear shelters that will be refurbished. The bunkers will be designed to withstand outdoor temperatures of 700 degrees Celsius, winds of 700 kilometers an hour, flooding for 500 hours or a wave of earthquakes over 10 on the Richter scale. And the company promises the bunkers will be outfitted with exercise equipment and an extensive wardrobe supplied with footwear "in all sizes." "As a co-owner of one of the Vivos shelters, you will only need to get there," the website promises. "Everything else is provided, including food, water, fuel, clothing, medical supplies, communications devices, security measures, as well as extremely comfortable accommodations". The first shelter, located in the California desert near Barstow, will be ready in September. And Vicino said "hundreds" of applications have already poured in, including inquiries from Europe. But having the financial means will not be enough to win a place in the shelters. Vicino said the company is looking for a range of backgrounds and skills, to ensure a "self-sufficient" community. He said "we want a little bit of everything in there, like on Noah& #39;s ark, so that they can assist each other." As for maintaining order, that should not present a problem, as about a third of the applicants come from police departments, private security firms or the US military. "I got a call yesterday from a special forces service member in Afghanistan wanting to sign up. He is very enthusiastic," he said. Despite his enthusiastic arguments in favor of preparing for the worst, Vicino himself has not yet reserved a spot. "I don& #39;t know if I can afford it!"